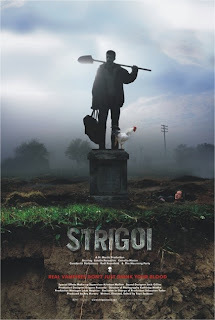 One of the coolest stories of this year’s fest is about a little UK/Romanian production called Strigoi. My friend DirtyRobot had the labourious task of screening about two hundred blind submissions for Toronto After Dark this year. It may sound like a neat job, but I saw a few of those titles and boy oh boy they can wear you out. However, it was during this process, that he found Strigoi. Strigoi! Damn that word is fun to say. Vlad (Catalin Paraschiv) returns home to his small Romanian village after trying to make a go of it as a doctor in Italy. When he finds out one of the local farmers has died, Vlad seems to be the only one who finds the death suspicious. The vampire subgenre is even more saturated than that of the zombie, so it is always tough to find new stories to tell. Surprisingly though, Strigoi manages to do just that. It is an exceptionally well-made film, with characters that have a genuine weight to them. You believe this place exists – and in actual fact I guess it does, as many the town’s real inhabitants were used as extras. The genre elements of Strigoi are rarely front and centre. I was expecting (and decidedly hoping for) this film to be more like Michele Soavi’s 1994 classic Cemetery Man, but that wasn’t the case at all. It’s a far more straightforward piece about trying to shuck tradition and find your lot in life. I think pace is probably Strigoi’s biggest enemy. Much like The Revenant, a film I watched earlier this week at the festival, there was clearly a good chunk that could be shaved from the film. Unfortunately, what should go is not as clearly defined as it was with The Revenant. It also may have been best to screen it before and not after Vampire Girl vs. Frankenstein Girl. I was climbing up the walls after that movie and to watch something incredibly low-key right afterwards was kind of a buzz kill. Strigoi was a little too drawn out for my tastes, but there’s no question that this is an impressive debut for this husband and wife team. I think this successful showing at After Dark could be the jumping off point of a great future. All together… STRIGOI! For more info on Strigoi, check out the screening’s Q&A video at Movie Moxie and a subsequent interview by Robert Mitchell.